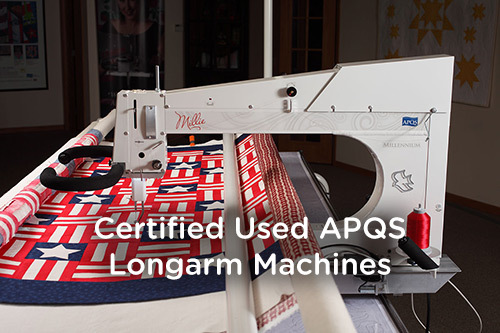 Home / APQS Longarm Machines / Certified Used APQS Longarm Machines Just Released! APQS just released a few certified used longarm machines! These longarms were fully inspected at the factory and come with a 1 year warranty. Some of the newer machines will have a longer warranty and will be listed below. They all come with a brand new table and you get to choose what size table. And they all currently have an “L” sized bobbin, but that can be easily converted to an “M” sized bobbin for $500. And Bliss can be added to any stand up longarm machine for $1,000. If you would like to invite one of these used longarms into your home, all you need is a $500 fully refundable deposit to hold your machine (most use a credit card over the phone). Supplies are very limited, so call Angela today at (502) 718-7148! These used machines have sold out. Want to be the first to know when certified used machines are available? Click here to join our mailing list!